While monitoring the cormorant colony at East Sand Island on a sunny Sunday afternoon, I noticed a flowered wreath had washed ashore on the North Beach. The wreath had a variety of flowers ranging from long stem red roses to carnations. I immediately began to think of a gift for my Mother, as Mother’s Day was closely approaching. While focusing my attention on the double-crested cormorant colony on East Sand Island, I soon noticed a cormorant returning to its nest with red roses in its bill. 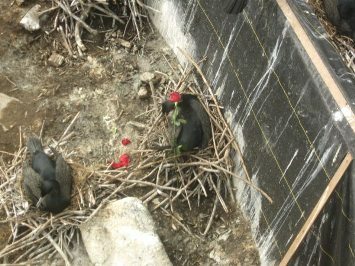 While the roses were used in the construction of the birds nest, I couldn’t help but think that the cormorant was wishing its mate a Happy Mother’s Day in celebration of the first egg laid in their nest.